Prior to BJPs ascendancy to power in 2014 cow slaughter was already outlawed in most Indian states barring Kerala, West Bengal and a few states in the north east. However, in some states like Maharashtra cows which had passed the age of milking could be slaughtered provided a fit for slaughter certificate is issued. No one had any problem with this arrangement. Neither the Hindus nor the Muslims nor the ardent vegetarians or vegans. By imposing a blanket ban on cow slaughter and on sale/ consumption of Beef in Maharashtra, BJP played a hideous communal agenda and its ramifications took a severe toll on the agrarian economy as well and rendered many butchers employed in this industry jobless. During the UPA no one bothered about issues like Beef eating and its availability in places where it was hitherto legal. Thanks to BJP for playing divisively sinister politics and ennobling Beef as one of the most important agenda in the national political discourse today. A government of fascists with a diabolical and ominous agenda which can stoop unimaginably low to sow the seeds of mutual distrust and communal hatred in the society in order to dismantle tolerance, peaceful coexistence and inclusiveness. 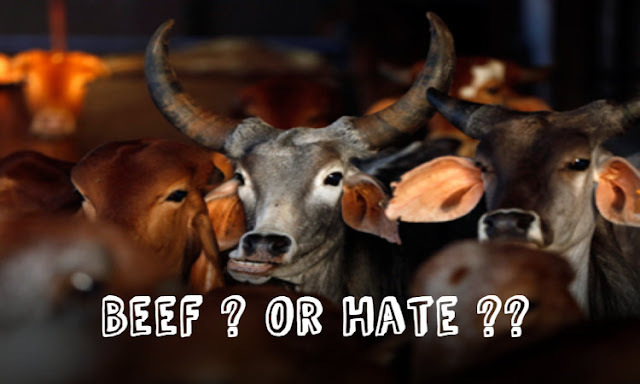 Pertinent Issue is not Beef but unrelenting hate mongering and unwarranted communal vitriolic of BJP in the shroud of religion which aims at pitting the Hindus and Muslims against each other. BJP wants to ensure that Hindus should look upon it as the saviour of their cultural heritage, religious beliefs and other values. Ban on Cow slaughter has a precedence in Indian history which dates back to the time of the Mughal Emperor Akbar. In vast swathes of North and Central India cow beef was never consumed by the populace in recent history. Still illegally if cow beef was available in the underground market no one made it a national issue.